OAKLAND, CA -- (MARKET WIRE) -- November 23, 2005 -- Football season is well underway and there are plenty of games ahead for you and your family to cheer on. For the next big face-off, take a break from tailgating's cold and crowds and have some quality family time with an at-home "couchgate." -- To Go Pack - Reduce trips to the kitchen by packing your munchies as if you were going to the field. 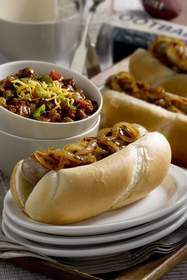 Bring platters of brats, the chili pot and paper plates and napkins (in team colors!) to the coffee table. Fill a cooler with rootbeers and park it couchside. -- Take a Gamble - Ask the kids to guess how many touchdowns they think each team will score. Let the winner choose dessert that night or give them a pass on chores. Everyone knows that game-time munchies are almost as important as the game itself. So, serve Big Game Barbecue Chili, a classic recipe with a new taste -- tangy KC Masterpiece Barbecue Sauce. You'll love the flavorful base and hearty mix of ground beef, peppers and spices. Pair it with a Brat Blitz loaded with barbecued onions to score bonus points with fans. Find more delicious barbecue recipes perfect for game day or any day, visit www.kcmasterpiece.com.